In Struggles of a Dreamer: The Battle between a Dream and Tradition, the stories of Tunde, a beggar on the streets of New York City, and Toku'te, the son of a farmer in a faraway land, are woven together in a charming tale full of intriguing characters and adventure. You will encounter the struggles of a dreamer as he faces the challenges of the limiting boundaries of his tradition. You will laugh, cry, experience romance, be frightened, and be held in suspense as you find out how Toku'te manages to remain afloat in a world that requires everyone to fit the same mold. 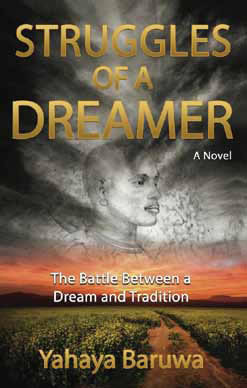 Struggles of a dreamer tells a story from the perspective of two characters living in different times and in different lands brought together by the teaching of a single book. Tunde immigrates from his homeland to North America. While trying to live out the American Dream, he falters as a result of poor decisions and bad luck until he comes across an item that soon changes his way of thinking. Toku'te, a young man who grows up in a time much different from Tunde, decides to leave home to pursue his dream. His success stemming from the very same book that changes Tunde's life. I met the author, Yahaya Baruwa, at my local Chapters book store where he had a table set up to tell passers-by about his book. He greeted me with a warm smile, a friendly handshake and a captivating story about how he followed his dreams to become a writer. His positivity is one of the first things you notice about him and it is very evident in his writing. Since I've started my blog, I found that I've mostly read up and coming books and new releases. Not really giving myself the time to see what else is out there. I'm glad I got the chance to meet Yahaya and had the honour to read his book. If you're looking for something different, Struggles of a Dreamer is it. The book will leave you inspired and lead you to think about past decisions and maybe even current struggles. It opens readers' minds into thinking in a more positive way. The book has made a difference in my life and if you choose to read it, I hope it does the same for you. When you will take decide, I will write my essay. You have to know writing method and follow a little simple procedure.